National Diploma, was said to have changed the number plate of the vehicle and driven it to Ibadan from where he picked four passengers en route to Lagos. 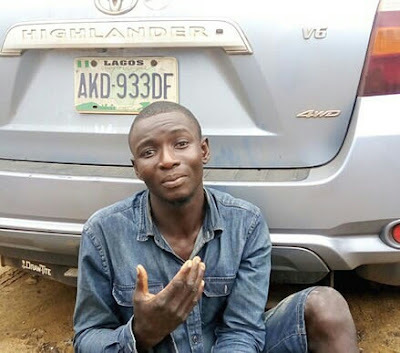 The 23-year-old said he conveyed four passengers to Lagos from Ibadan and charged them N500 each to raise money to fuel the SUV. Asked how he managed to beat the many security checkpoints on the highway, Ayo explained that he refused to stop when waved down by policemen. What has your employer done to you na? Now you are going to suffer for nothing chaiii.